This article is about the chemical element. For other uses, see Xenon (disambiguation). Naturally occurring xenon consists of eight stable isotopes. More than 40 unstable xenon isotopes undergo radioactive decay, and the isotope ratios of xenon are an important tool for studying the early history of the Solar System. Radioactive xenon-135 is produced by beta decay from iodine-135 (a product of nuclear fission), and is the most significant (and unwanted) neutron absorber in nuclear reactors. 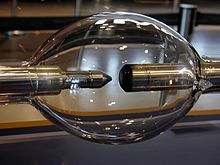 Xenon was discovered in England by the Scottish chemist William Ramsay and English chemist Morris Travers in September 1898, shortly after their discovery of the elements krypton and neon. They found xenon in the residue left over from evaporating components of liquid air. Ramsay suggested the name xenon for this gas from the Greek word ξένον [xenon], neuter singular form of ξένος [xenos], meaning 'foreign(er)', 'strange(r)', or 'guest'. In 1902, Ramsay estimated the proportion of xenon in the Earth's atmosphere to be one part in 20 million. During the 1930s, American engineer Harold Edgerton began exploring strobe light technology for high speed photography. This led him to the invention of the xenon flash lamp in which light is generated by passing brief electric current through a tube filled with xenon gas. In 1934, Edgerton was able to generate flashes as brief as one microsecond with this method. In 1939, American physician Albert R. Behnke Jr. began exploring the causes of "drunkenness" in deep-sea divers. He tested the effects of varying the breathing mixtures on his subjects, and discovered that this caused the divers to perceive a change in depth. From his results, he deduced that xenon gas could serve as an anesthetic. Although Russian toxicologist Nikolay V. Lazarev apparently studied xenon anesthesia in 1941, the first published report confirming xenon anesthesia was in 1946 by American medical researcher John H. Lawrence, who experimented on mice. Xenon was first used as a surgical anesthetic in 1951 by American anesthesiologist Stuart C. Cullen, who successfully used it with two patients. ). Since O2 and xenon have almost the same first ionization potential, Bartlett realized that platinum hexafluoride might also be able to oxidize xenon. On March 23, 1962, he mixed the two gases and produced the first known compound of a noble gas, xenon hexafluoroplatinate. Bartlett thought its composition to be Xe+[PtF6]−, but later work revealed that it was probably a mixture of various xenon-containing salts. Since then, many other xenon compounds have been discovered, in addition to some compounds of the noble gases argon, krypton, and radon, including argon fluorohydride (HArF), krypton difluoride (KrF2), and radon fluoride. By 1971, more than 80 xenon compounds were known. In November 1989, IBM scientists demonstrated a technology capable of manipulating individual atoms. The program, called IBM in atoms, used a scanning tunneling microscope to arrange 35 individual xenon atoms on a substrate of chilled crystal of nickel to spell out the three letter company initialism. It was the first time atoms had been precisely positioned on a flat surface. A layer of solid xenon floating on top of liquid xenon inside a high voltage apparatus. Liquid (featureless) and crystalline solid Xe nanoparticles produced by implanting Xe+ ions into aluminium at room temperature. Xenon has atomic number 54; that is, its nucleus contains 54 protons. At standard temperature and pressure, pure xenon gas has a density of 5.761 kg/m3, about 4.5 times the density of the Earth's atmosphere at sea level, 1.217 kg/m3. As a liquid, xenon has a density of up to 3.100 g/mL, with the density maximum occurring at the triple point. Liquid xenon has a high polarizability due to its large atomic volume, and thus is an excellent solvent. It can dissolve hydrocarbons, biological molecules, and even water. Under the same conditions, the density of solid xenon, 3.640 g/cm3, is greater than the average density of granite, 2.75 g/cm3. Under gigapascals of pressure, xenon forms a metallic phase. Solid xenon changes from face-centered cubic (fcc) to hexagonal close packed (hcp) crystal phase under pressure and begins to turn metallic at about 140 GPa, with no noticeable volume change in the hcp phase. It is completely metallic at 155 GPa. When metallized, xenon appears sky blue because it absorbs red light and transmits other visible frequencies. Such behavior is unusual for a metal and is explained by the relatively small width of the electron bands in that state. Liquid or solid xenon nanoparticles can be formed at room temperature by implanting Xe+ ions into a solid matrix. Many solids have lattice constants smaller than solid Xe. This results in compression of the implanted Xe to pressures that may be sufficient for its liquefaction or solidification. In a gas-filled tube, xenon emits a blue or lavenderish glow when excited by electrical discharge. Xenon emits a band of emission lines that span the visual spectrum, but the most intense lines occur in the region of blue light, producing the coloration. Xenon is a trace gas in Earth's atmosphere, occurring at 6992870000000000000♠87±1 nL/L (parts per billion), or approximately 1 part per 11.5 million. It is also found as a component of gases emitted from some mineral springs. Xenon is obtained commercially as a by-product of the separation of air into oxygen and nitrogen. After this separation, generally performed by fractional distillation in a double-column plant, the liquid oxygen produced will contain small quantities of krypton and xenon. By additional fractional distillation, the liquid oxygen may be enriched to contain 0.1–0.2% of a krypton/xenon mixture, which is extracted either by absorption onto silica gel or by distillation. Finally, the krypton/xenon mixture may be separated into krypton and xenon by further distillation. Worldwide production of xenon in 1998 was estimated at 5,000–7,000 m3. Because of its scarcity, xenon is much more expensive than the lighter noble gases—approximate prices for the purchase of small quantities in Europe in 1999 were 10 €/L for xenon, 1 €/L for krypton, and 0.20 €/L for neon, while the much more plentiful argon costs less than a cent per liter. Within the Solar System, the nucleon fraction of xenon is 1.56 × 10−8, for an abundance of approximately one part in 630 thousand of the total mass. Xenon is relatively rare in the Sun's atmosphere, on Earth, and in asteroids and comets. The abundance of xenon in the atmosphere of planet Jupiter is unusually high, about 2.6 times that of the Sun. This abundance remains unexplained, but may have been caused by an early and rapid buildup of planetesimals—small, subplanetary bodies—before the heating of the presolar disk. (Otherwise, xenon would not have been trapped in the planetesimal ices.) The problem of the low terrestrial xenon may be explained by covalent bonding of xenon to oxygen within quartz, reducing the outgassing of xenon into the atmosphere. Unlike the lower-mass noble gases, the normal stellar nucleosynthesis process inside a star does not form xenon. Elements more massive than iron-56 consume energy through fusion, and the synthesis of xenon represents no energy gain for a star. Instead, xenon is formed during supernova explosions, in classical nova explosions, by the slow neutron-capture process (s-process) in red giant stars that have exhausted their core hydrogen and entered the asymptotic giant branch, and from radioactive decay, for example by beta decay of extinct iodine-129 and spontaneous fission of thorium, uranium, and plutonium. Naturally occurring xenon is composed of eight stable isotopes. This is more than any other element except tin, which has ten. The isotopes 124Xe and 134Xe are predicted by theory to undergo double beta decay, but this has never been observed so they are considered stable. In addition, more than 40 unstable isotopes that have been studied. The longest lived of these isotopes is 136Xe, which undergoes double beta decay with a half-life of 2.11 × 1021 yr. 129Xe is produced by beta decay of 129I, which has a half-life of 16 million years. 131mXe, 133Xe, 133mXe, and 135Xe are some of the fission products of 235U and 239Pu, and are used to detect and monitor nuclear explosions. Nuclei of two of the stable isotopes of xenon, 129Xe and 131Xe, have non-zero intrinsic angular momenta (nuclear spins, suitable for nuclear magnetic resonance). The nuclear spins can be aligned beyond ordinary polarization levels by means of circularly polarized light and rubidium vapor. The resulting spin polarization of xenon nuclei can surpass 50% of its maximum possible value, greatly exceeding the thermal equilibrium value dictated by paramagnetic statistics (typically 0.001% of the maximum value at room temperature, even in the strongest magnets). Such non-equilibrium alignment of spins is a temporary condition, and is called hyperpolarization. The process of hyperpolarizing the xenon is called optical pumping (although the process is different from pumping a laser). Because a 129Xe nucleus has a spin of 1/2, and therefore a zero electric quadrupole moment, the 129Xe nucleus does not experience any quadrupolar interactions during collisions with other atoms, and the hyperpolarization persists for long periods even after the engendering light and vapor have been removed. Spin polarization of 129Xe can persist from several seconds for xenon atoms dissolved in blood to several hours in the gas phase and several days in deeply frozen solid xenon. In contrast, 131Xe has a nuclear spin value of ​3⁄2 and a nonzero quadrupole moment, and has t1 relaxation times in the millisecond and second ranges. Some radioactive isotopes of xenon (for example, 133Xe and 135Xe) are produced by neutron irradiation of fissionable material within nuclear reactors. 135Xe is of considerable significance in the operation of nuclear fission reactors. 135Xe has a huge cross section for thermal neutrons, 2.6×106 barns, and operates as a neutron absorber or "poison" that can slow or stop the chain reaction after a period of operation. This was discovered in the earliest nuclear reactors built by the American Manhattan Project for plutonium production. However, the designers had made provisions in the design to increase the reactor's reactivity (the number of neutrons per fission that go on to fission other atoms of nuclear fuel).135Xe reactor poisoning was a major factor in the Chernobyl disaster. A shutdown or decrease of power of a reactor can result in buildup of 135Xe, with reactor operation going into a condition known as the iodine pit. Under adverse conditions, relatively high concentrations of radioactive xenon isotopes may emanate from cracked fuel rods, or fissioning of uranium in cooling water. Because xenon is a tracer for two parent isotopes, xenon isotope ratios in meteorites are a powerful tool for studying the formation of the Solar System. The iodine–xenon method of dating gives the time elapsed between nucleosynthesis and the condensation of a solid object from the solar nebula. In 1960, physicist John H. Reynolds discovered that certain meteorites contained an isotopic anomaly in the form of an overabundance of xenon-129. He inferred that this was a decay product of radioactive iodine-129. This isotope is produced slowly by cosmic ray spallation and nuclear fission, but is produced in quantity only in supernova explosions. Because the half-life of 129I is comparatively short on a cosmological time scale (16 million years), this demonstrated that only a short time had passed between the supernova and the time the meteorites had solidified and trapped the 129I. These two events (supernova and solidification of gas cloud) were inferred to have happened during the early history of the Solar System, because the 129I isotope was likely generated shortly before the Solar System was formed, seeding the solar gas cloud with isotopes from a second source. This supernova source may also have caused collapse of the solar gas cloud. In a similar way, xenon isotopic ratios such as 129Xe/130Xe and 136Xe/130Xe are a powerful tool for understanding planetary differentiation and early outgassing. For example, the atmosphere of Mars shows a xenon abundance similar to that of Earth (0.08 parts per million) but Mars shows a greater abundance of 129Xe than the Earth or the Sun. Since this isotope is generated by radioactive decay, the result may indicate that Mars lost most of its primordial atmosphere, possibly within the first 100 million years after the planet was formed. In another example, excess 129Xe found in carbon dioxide well gases from New Mexico is believed to be from the decay of mantle-derived gases from soon after Earth's formation. After Neil Bartlett's discovery in 1962 that xenon can form chemical compounds, a large number of xenon compounds have been discovered and described. Almost all known xenon compounds contain the electronegative atoms fluorine or oxygen. The chemistry of xenon in each oxidation state is analogous to that of the neighboring element iodine in the immediately lower oxidation state. 6. XeF is theorized to be unstable. These are the starting points for the synthesis of almost all xenon compounds. 2 also forms coordination complexes with transition metal ions. More than 30 such complexes have been synthesized and characterized. 2 is less stable than the van der Waals complex. 4), both of which are dangerously explosive and powerful oxidizing agents, and xenon dioxide (XeO2), which was reported in 2011 with a coordination number of four. XeO2 forms when xenon tetrafluoride is poured over ice. Its crystal structure may allow it to replace silicon in silicate minerals. The XeOO+ cation has been identified by infrared spectroscopy in solid argon. To prevent decomposition, the xenon tetroxide thus formed is quickly cooled to form a pale-yellow solid. It explodes above −35.9 °C into xenon and oxygen gas. 3, where C6F5 is the pentafluorophenyl group. 2, and is remarkable in having direct chemical bonds between two notoriously unreactive atoms, xenon and gold, with xenon acting as a transition metal ligand. 11 contains a Xe–Xe bond, the longest element-element bond known (308.71 pm = 3.0871 Å). In 1995, M. Räsänen and co-workers, scientists at the University of Helsinki in Finland, announced the preparation of xenon dihydride (HXeH), and later xenon hydride-hydroxide (HXeOH), hydroxenoacetylene (HXeCCH), and other Xe-containing molecules. In 2008, Khriachtchev et al. reported the preparation of HXeOXeH by the photolysis of water within a cryogenic xenon matrix. Deuterated molecules, HXeOD and DXeOH, have also been produced. In addition to compounds where xenon forms a chemical bond, xenon can form clathrates—substances where xenon atoms or pairs are trapped by the crystalline lattice of another compound. One example is xenon hydrate (Xe•5.75 H2O), where xenon atoms occupy vacancies in a lattice of water molecules. This clathrate has a melting point of 24 °C. The deuterated version of this hydrate has also been produced. Another example is xenon hydride (Xe(H2)8), in which xenon pairs (dimers) are trapped inside solid hydrogen. Such clathrate hydrates can occur naturally under conditions of high pressure, such as in Lake Vostok underneath the Antarctic ice sheet. Clathrate formation can be used to fractionally distill xenon, argon and krypton. Xenon can also form endohedral fullerene compounds, where a xenon atom is trapped inside a fullerene molecule. The xenon atom trapped in the fullerene can be observed by 129Xe nuclear magnetic resonance (NMR) spectroscopy. Through the sensitive chemical shift of the xenon atom to its environment, chemical reactions on the fullerene molecule can be analyzed. These observations are not without caveat, however, because the xenon atom has an electronic influence on the reactivity of the fullerene. When xenon atoms are in the ground energy state, they repel each other and will not form a bond. When xenon atoms becomes energized, however, they can form an excimer (excited dimer) until the electrons return to the ground state. This entity is formed because the xenon atom tends to complete the outermost electronic shell by adding an electron from a neighboring xenon atom. The typical lifetime of a xenon excimer is 1–5 ns, and the decay releases photons with wavelengths of about 150 and 173 nm. Xenon can also form excimers with other elements, such as the halogens bromine, chlorine, and fluorine. Although xenon is rare and relatively expensive to extract from the Earth's atmosphere, it has a number of applications. Xenon is used in light-emitting devices called xenon flash lamps, used in photographic flashes and stroboscopic lamps; to excite the active medium in lasers which then generate coherent light; and, occasionally, in bactericidal lamps. The first solid-state laser, invented in 1960, was pumped by a xenon flash lamp, and lasers used to power inertial confinement fusion are also pumped by xenon flash lamps. Continuous, short-arc, high pressure xenon arc lamps have a color temperature closely approximating noon sunlight and are used in solar simulators. That is, the chromaticity of these lamps closely approximates a heated black body radiator at the temperature of the Sun. First introduced in the 1940s, these lamps replaced the shorter-lived carbon arc lamps in movie projectors. They are also employed in typical 35mm, IMAX, and digital film projection systems. They are an excellent source of short wavelength ultraviolet radiation and have intense emissions in the near infrared used in some night vision systems. Xenon is used as a starter gas in HID automotive headlights, and high-end "tactical" flashlights. The individual cells in a plasma display contain a mixture of xenon and neon ionized with electrodes. The interaction of this plasma with the electrodes generates ultraviolet photons, which then excite the phosphor coating on the front of the display. Xenon is used as a "starter gas" in high pressure sodium lamps. It has the lowest thermal conductivity and lowest ionization potential of all the non-radioactive noble gases. As a noble gas, it does not interfere with the chemical reactions occurring in the operating lamp. The low thermal conductivity minimizes thermal losses in the lamp while in the operating state, and the low ionization potential causes the breakdown voltage of the gas to be relatively low in the cold state, which allows the lamp to be more easily started. In 1962, a group of researchers at Bell Laboratories discovered laser action in xenon, and later found that the laser gain was improved by adding helium to the lasing medium. The first excimer laser used a xenon dimer (Xe2) energized by a beam of electrons to produce stimulated emission at an ultraviolet wavelength of 176 nm. Xenon chloride and xenon fluoride have also been used in excimer (or, more accurately, exciplex) lasers. Xenon has been used as a general anesthetic. Although it is expensive, anesthesia machines that can deliver xenon are expected to appear on the European market because advances in recovery and recycling of xenon have made it economically viable. Xenon interacts with many different receptors and ion channels, and like many theoretically multi-modal inhalation anesthetics, these interactions are likely complementary. Xenon is a high-affinity glycine-site NMDA receptor antagonist. However, xenon is different from certain other NMDA receptor antagonists in that it is not neurotoxic and it inhibits the neurotoxicity of ketamine and nitrous oxide, while actually producing neuroprotective effects. Unlike ketamine and nitrous oxide, xenon does not stimulate a dopamine efflux in the nucleus accumbens. Like nitrous oxide and cyclopropane, xenon activates the two-pore domain potassium channel TREK-1. A related channel TASK-3 also implicated in the actions of inhalation anesthetics is insensitive to xenon. Xenon inhibits nicotinic acetylcholine α4β2 receptors which contribute to spinally mediated analgesia. Xenon is an effective inhibitor of plasma membrane Ca2+ ATPase. Xenon inhibits Ca2+ ATPase by binding to a hydrophobic pore within the enzyme and preventing the enzyme from assuming active conformations. Xenon is a competitive inhibitor of the serotonin 5-HT3 receptor. While neither anesthetic nor antinociceptive, this reduces anesthesia-emergent nausea and vomiting. Xenon has a minimum alveolar concentration (MAC) of 72% at age 40, making it 44% more potent than N2O as an anesthetic. Thus, it can be used with oxygen in concentrations that have a lower risk of hypoxia. 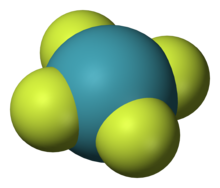 Unlike nitrous oxide (N2O), xenon is not a greenhouse gas and is viewed as environmentally friendly. Though recycled in modern systems, xenon vented to the atmosphere is only returning to its original source, without environmental impact. Xenon induces robust cardioprotection and neuroprotection through a variety of mechanisms. Through its influence on Ca2+, K+, KATP\HIF, and NMDA antagonism, xenon is neuroprotective when administered before, during and after ischemic insults. Xenon is a high affinity antagonist at the NMDA receptor glycine site. Xenon is cardioprotective in ischemia-reperfusion conditions by inducing pharmacologic non-ischemic preconditioning. Xenon is cardioprotective by activating PKC-epsilon and downstream p38-MAPK. Xenon mimics neuronal ischemic preconditioning by activating ATP sensitive potassium channels. Xenon allosterically reduces ATP mediated channel activation inhibition independently of the sulfonylurea receptor1 subunit, increasing KATP open-channel time and frequency. Inhaling a xenon/oxygen mixture activates production of the transcription factor HIF-1-alpha, which may lead to increased production of erythropoietin. The latter hormone is known to increase red blood cell production and athletic performance. Reportedly, doping with xenon inhalation has been used in Russia since 2004 and perhaps earlier. On August 31, 2014, the World Anti Doping Agency (WADA) added xenon (and argon) to the list of prohibited substances and methods, although no reliable doping tests for these gases have yet been developed. In addition, effects of xenon on erythropoietin production in humans have not been demonstrated, so far. Gamma emission from the radioisotope 133Xe of xenon can be used to image the heart, lungs, and brain, for example, by means of single photon emission computed tomography. 133Xe has also been used to measure blood flow. Xenon, particularly hyperpolarized 129Xe, is a useful contrast agent for magnetic resonance imaging (MRI). In the gas phase, it can image cavities in a porous sample, alveoli in lungs, or the flow of gases within the lungs. Because xenon is soluble both in water and in hydrophobic solvents, it can image various soft living tissues. The xenon chloride excimer laser has certain dermatological uses. Because of the xenon atom's large, flexible outer electron shell, the NMR spectrum changes in response to surrounding conditions and can be used to monitor the surrounding chemical circumstances. For instance, xenon dissolved in water, xenon dissolved in hydrophobic solvent, and xenon associated with certain proteins can be distinguished by NMR. Hyperpolarized xenon can be used by surface chemists. Normally, it is difficult to characterize surfaces with NMR because signals from a surface are overwhelmed by signals from the atomic nuclei in the bulk of the sample, which are much more numerous than surface nuclei. However, nuclear spins on solid surfaces can be selectively polarized by transferring spin polarization to them from hyperpolarized xenon gas. This makes the surface signals strong enough to measure and distinguish from bulk signals. In nuclear energy studies, xenon is used in bubble chambers, probes, and in other areas where a high molecular weight and inert chemistry is desirable. A by-product of nuclear weapon testing is the release of radioactive xenon-133 and xenon-135. These isotopes are monitored to ensure compliance with nuclear test ban treaties, and to confirm nuclear tests by states such as North Korea. 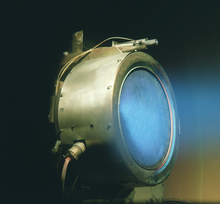 A prototype of a xenon ion engine being tested at NASA's Jet Propulsion Laboratory. Liquid xenon is used in calorimeters to measure gamma rays, and as a detector of hypothetical weakly interacting massive particles, or WIMPs. When a WIMP collides with a xenon nucleus, theory predicts it will impart enough energy to cause ionization and scintillation. Liquid xenon is useful for these experiments because its density makes dark matter interaction more likely and it permits a quiet detector through self-shielding. Xenon is the preferred propellant for ion propulsion of spacecraft because it has low ionization potential per atomic weight and can be stored as a liquid at near room temperature (under high pressure), yet easily evaporated to feed the engine. Xenon is inert, environmentally friendly, and less corrosive to an ion engine than other fuels such as mercury or caesium. Xenon was first used for satellite ion engines during the 1970s. It was later employed as a propellant for JPL's Deep Space 1 probe, Europe's SMART-1 spacecraft and for the three ion propulsion engines on NASA's Dawn Spacecraft. Chemically, the perxenate compounds are used as oxidizing agents in analytical chemistry. Xenon difluoride is used as an etchant for silicon, particularly in the production of microelectromechanical systems (MEMS). The anticancer drug 5-fluorouracil can be produced by reacting xenon difluoride with uracil. Xenon is also used in protein crystallography. Applied at pressures from 0.5 to 5 MPa (5 to 50 atm) to a protein crystal, xenon atoms bind in predominantly hydrophobic cavities, often creating a high-quality, isomorphous, heavy-atom derivative that can be used for solving the phase problem. Because they are strongly oxidative, many oxygen-xenon compounds are toxic; they are also explosive (highly exothermic), breaking down to elemental xenon and diatomic oxygen (O2) with much stronger chemical bonds than the xenon compounds. Xenon gas can be safely kept in normal sealed glass or metal containers at standard temperature and pressure. However, it readily dissolves in most plastics and rubber, and will gradually escape from a container sealed with such materials. Xenon is non-toxic, although it does dissolve in blood and belongs to a select group of substances that penetrate the blood–brain barrier, causing mild to full surgical anesthesia when inhaled in high concentrations with oxygen. The speed of sound in xenon gas (169 m/s) is less than that in air because the average velocity of the heavy xenon atoms is less than that of nitrogen and oxygen molecules in air. Hence, xenon vibrates more slowly in the vocal cords when exhaled and produces lowered voice tones, an effect opposite to the high-toned voice produced in helium. Like helium, xenon does not satisfy the body's need for oxygen, and it is both a simple asphyxiant and an anesthetic more powerful than nitrous oxide; consequently, and because xenon is expensive, many universities have prohibited the voice stunt as a general chemistry demonstration. The gas sulfur hexafluoride is similar to xenon in molecular weight (146 versus 131), less expensive, and though an asphyxiant, not toxic or anesthetic; it is often substituted in these demonstrations. Dense gases such as xenon and sulfur hexafluoride can be breathed safely when mixed with at least 20% oxygen. Xenon at 80% concentration along with 20% oxygen rapidly produces the unconsciousness of general anesthesia (and has been used for this, as discussed above). Breathing mixes gases of different densities very effectively and rapidly so that heavier gases are purged along with the oxygen, and do not accumulate at the bottom of the lungs. There is, however, a danger associated with any heavy gas in large quantities: it may sit invisibly in a container, and a person who enters an area filled with an odorless, colorless gas may be asphyxiated without warning. Xenon is rarely used in large enough quantities for this to be a concern, though the potential for danger exists any time a tank or container of xenon is kept in an unventilated space. ^ Simpson, J. A.; Weiner, E. S. C., eds. (1989). "Xenon". Oxford English Dictionary. 20 (2nd ed.). Clarendon Press. ISBN 0-19-861232-X. ^ "Xenon". Dictionary.com Unabridged. 2010. Retrieved 2010-05-06. ^ "Xenon". Gas Encyclopedia. Air Liquide. 2009. ^ a b Haynes, William M., ed. (2011). CRC Handbook of Chemistry and Physics (92nd ed.). Boca Raton, FL: CRC Press. p. 4.123. ISBN 1439855110. ^ Hwang, Shuen-Cheng; Weltmer, William R. (2000). "Helium Group Gases". Kirk-Othmer Encyclopedia of Chemical Technology. Wiley. pp. 343–383. doi:10.1002/0471238961.0701190508230114.a01. ISBN 0-471-23896-1. ^ Magnetic susceptibility of the elements and inorganic compounds, in Lide, D. R., ed. (2005). CRC Handbook of Chemistry and Physics (86th ed.). Boca Raton (FL): CRC Press. ISBN 0-8493-0486-5. ^ Albert, J. B.; Auger, M.; Auty, D. J.; Barbeau, P. S.; Beauchamp, E.; Beck, D.; Belov, V.; Benitez-Medina, C.; Bonatt, J.; Breidenbach, M.; Brunner, T.; Burenkov, A.; Cao, G. F.; Chambers, C.; Chaves, J.; Cleveland, B.; Cook, S.; Craycraft, A.; Daniels, T.; Danilov, M.; Daugherty, S. J.; Davis, C. G.; Davis, J.; Devoe, R.; Delaquis, S.; Dobi, A.; Dolgolenko, A.; Dolinski, M. J.; Dunford, M.; et al. (2014). "Improved measurement of the 2νββ half-life of 136Xe with the EXO-200 detector". Physical Review C. 89. arXiv:1306.6106. Bibcode:2014PhRvC..89a5502A. doi:10.1103/PhysRevC.89.015502. ^ Staff (2007). "Xenon". Columbia Electronic Encyclopedia (6th ed.). Columbia University Press. Retrieved 2007-10-23. ^ a b Husted, Robert; Boorman, Mollie (December 15, 2003). "Xenon". Los Alamos National Laboratory, Chemical Division. Retrieved 2007-09-26. ^ Rabinovich, Viktor Abramovich; Vasserman, A. A.; Nedostup, V. I.; Veksler, L. S. (1988). Thermophysical properties of neon, argon, krypton, and xenon. Washington, DC: Hemisphere Publishing Corp. Bibcode:1988wdch...10.....R. ISBN 0-89116-675-0. —National Standard Reference Data Service of the USSR. Volume 10. ^ a b c Burke, James (2003). Twin Tracks: The Unexpected Origins of the Modern World. Oxford University Press. p. 33. ISBN 0-7432-2619-4. ^ a b Mellor, David (2000). Sound Person's Guide to Video. Focal Press. p. 186. ISBN 0-240-51595-1. ^ Sanders, Robert D.; Ma, Daqing; Maze, Mervyn (2005). "Xenon: elemental anaesthesia in clinical practice". British Medical Bulletin. 71 (1): 115–35. doi:10.1093/bmb/ldh034. PMID 15728132. ^ a b Basov, N. G.; Danilychev, V. A.; Popov, Yu. M. (1971). "Stimulated Emission in the Vacuum Ultraviolet Region". Soviet Journal of Quantum Electronics. 1 (1): 18–22. Bibcode:1971QuEle...1...18B. doi:10.1070/QE1971v001n01ABEH003011. ^ a b Toyserkani, E.; Khajepour, A.; Corbin, S. (2004). Laser Cladding. CRC Press. p. 48. ISBN 0-8493-2172-7. ^ Ball, Philip (May 1, 2002). "Xenon outs WIMPs". Nature. Retrieved 2007-10-08. ^ a b Saccoccia, G.; del Amo, J. G.; Estublier, D. (August 31, 2006). "Ion engine gets SMART-1 to the Moon". ESA. Retrieved 2007-10-01. ^ a b Kaneoka, Ichiro (1998). "Xenon's Inside Story". Science. 280 (5365): 851–852. doi:10.1126/science.280.5365.851b. ^ a b Stacey, Weston M. (2007). Nuclear Reactor Physics. Wiley-VCH. p. 213. ISBN 3-527-40679-4. ^ Ramsay, Sir William (December 12, 1904). "Nobel Lecture – The Rare Gases of the Atmosphere". nobelprize.org. Nobel Media AB. Retrieved 15 November 2015. ^ Ramsay, W.; Travers, M. W. (1898). "On the extraction from air of the companions of argon, and neon". Report of the Meeting of the British Association for the Advancement of Science: 828. ^ Gagnon, Steve. "It's Elemental – Xenon". Thomas Jefferson National Accelerator Facility. Retrieved 2007-06-16. ^ Anonymous (1904). Daniel Coit Gilman; Harry Thurston Peck; Frank Moore Colby (eds.). The New International Encyclopædia. Dodd, Mead and Company. p. 906. ^ Staff (1991). The Merriam-Webster New Book of Word Histories. Merriam-Webster, Inc. p. 513. ISBN 0-87779-603-3. ^ Ramsay, William (1902). "An Attempt to Estimate the Relative Amounts of Krypton and of Xenon in Atmospheric Air". Proceedings of the Royal Society of London. 71 (467–476): 421–426. doi:10.1098/rspl.1902.0121. ^ Anonymous. "History". Millisecond Cinematography. Archived from the original on 2006-08-22. Retrieved 2007-11-07. ^ Paschotta, Rüdiger (November 1, 2007). "Lamp-pumped lasers". Encyclopedia of Laser Physics and Technology. RP Photonics. Retrieved 2007-11-07. ^ Marx, Thomas; Schmidt, Michael; Schirmer, Uwe; Reinelt, Helmut (2000). "Xenon anesthesia" (PDF). Journal of the Royal Society of Medicine. 93 (10): 513–7. PMC 1298124. PMID 11064688. Retrieved 2007-10-02. ". Proceedings of the Chemical Society. London: Chemical Society (3): 115. doi:10.1039/PS9620000097. ^ Bartlett, N. (1962). "Xenon hexafluoroplatinate (V) Xe+[PtF6]−". Proceedings of the Chemical Society. London: Chemical Society (6): 218. doi:10.1039/PS9620000197. ^ Graham, L.; Graudejus, O.; Jha N.K. ; Bartlett, N. (2000). "Concerning the nature of XePtF6". Coordination Chemistry Reviews. 197 (1): 321–334. doi:10.1016/S0010-8545(99)00190-3. ^ Holleman, A. F.; Wiberg, Egon (2001). Bernhard J. Aylett (ed.). Inorganic Chemistry. translated by Mary Eagleson and William Brewer. San Diego: Academic Press. ISBN 0-12-352651-5. ; translation of Lehrbuch der Anorganischen Chemie, founded by A. F. Holleman, continued by Egon Wiberg, edited by Nils Wiberg, Berlin: de Gruyter, 1995, 34th edition, ISBN 3-11-012641-9. ^ Steel, Joanna (2007). "Biography of Neil Bartlett". College of Chemistry, University of California, Berkeley. Archived from the original on September 23, 2009. Retrieved 2007-10-25. ^ Bartlett, Neil (2003-09-09). "The Noble Gases". Chemical & Engineering News. American Chemical Society. 81 (36). Retrieved 2007-10-01. ^ Khriachtchev, Leonid; Pettersson, Mika; Runeberg, Nino; Lundell, Jan; Räsänen, Markku (2000-08-24). "A stable argon compound". Nature. 406 (6798): 874–6. doi:10.1038/35022551. PMID 10972285. Retrieved 2008-06-04. ^ MacKenzie, D. R. (1963). "Krypton Difluoride: Preparation and Handling". Science. 141 (3586): 1171. Bibcode:1963Sci...141.1171M. doi:10.1126/science.141.3586.1171. PMID 17751791. ^ Paul R. Fields; Lawrence Stein & Moshe H. Zirin (1962). "Radon Fluoride". Journal of the American Chemical Society. 84 (21): 4164–4165. doi:10.1021/ja00880a048. ^ "Xenon". Periodic Table Online. CRC Press. Archived from the original on April 10, 2007. Retrieved 2007-10-08. ^ Moody, G. J. (1974). "A Decade of Xenon Chemistry". Journal of Chemical Education. 51 (10): 628–630. Bibcode:1974JChEd..51..628M. doi:10.1021/ed051p628. Retrieved 2007-10-16. ^ Williams, David R. (April 19, 2007). "Earth Fact Sheet". NASA. Retrieved 2007-10-04. ^ a b Aprile, Elena; Bolotnikov, Aleksey E.; Doke, Tadayoshi (2006). Noble Gas Detectors. Wiley-VCH. pp. 8–9. ISBN 3-527-60963-6. ^ Rentzepis, P. M.; Douglass, D. C. (1981-09-10). "Xenon as a solvent". Nature. 293 (5828): 165–166. Bibcode:1981Natur.293..165R. doi:10.1038/293165a0. ^ Caldwell, W. A.; Nguyen, J.; Pfrommer, B.; Louie, S.; Jeanloz, R. (1997). "Structure, bonding and geochemistry of xenon at high pressures". Science. 277 (5328): 930–933. doi:10.1126/science.277.5328.930. ^ Fontes, E. "Golden Anniversary for Founder of High-pressure Program at CHESS". Cornell University. Retrieved 2009-05-30. ^ Eremets, Mikhail I.; Gregoryanz, Eugene A.; Struzhkin, Victor V.; Mao, Ho-Kwang; Hemley, Russell J.; Mulders, Norbert; Zimmerman, Neil M. (2000). "Electrical Conductivity of Xenon at Megabar Pressures". Physical Review Letters. 85 (13): 2797–800. Bibcode:2000PhRvL..85.2797E. doi:10.1103/PhysRevLett.85.2797. PMID 10991236. ^ Iakoubovskii, Konstantin; Mitsuishi, Kazutaka; Furuya, Kazuo (2008). "Structure and pressure inside Xe nanoparticles embedded in Al". Physical Review B. 78 (6). Bibcode:2008PhRvB..78f4105I. doi:10.1103/PhysRevB.78.064105. ^ Bader, Richard F. W. "An Introduction to the Electronic Structure of Atoms and Molecules". McMaster University. Retrieved 2007-09-27. ^ Talbot, John. "Spectra of Gas Discharges". Rheinisch-Westfälische Technische Hochschule Aachen. Archived from the original on July 18, 2007. Retrieved 2006-08-10. ^ Watts, William Marshall (1904). An Introduction to the Study of Spectrum Analysis. London: Longmans, Green, and Co.
^ Hwang, Shuen-Cheng; Robert D. Lein; Daniel A. Morgan (2005). "Noble Gases". Kirk-Othmer Encyclopedia of Chemical Technology (5th ed.). Wiley. doi:10.1002/0471238961.0701190508230114.a01. ISBN 0-471-48511-X. ^ Kerry, Frank G. (2007). Industrial Gas Handbook: Gas Separation and Purification. CRC Press. pp. 101–103. ISBN 0-8493-9005-2. ^ "Xenon – Xe". CFC StarTec LLC. August 10, 1998. Retrieved 2007-09-07. ^ a b Häussinger, Peter; Glatthaar, Reinhard; Rhode, Wilhelm; Kick, Helmut; Benkmann, Christian; Weber, Josef; Wunschel, Hans-Jörg; Stenke, Viktor; Leicht, Edith; Stenger, Hermann (2001). "Noble Gases". Ullmann's Encyclopedia of Industrial Chemistry (6th ed.). Wiley. doi:10.1002/14356007.a17_485. ISBN 3-527-20165-3. ^ Mahaffy, P. R.; Niemann, H. B.; Alpert, A.; Atreya, S. K.; Demick, J.; Donahue, T. M.; Harpold, D. N.; Owen, T. C. (2000). "Noble gas abundance and isotope ratios in the atmosphere of Jupiter from the Galileo Probe Mass Spectrometer". Journal of Geophysical Research. 105 (E6): 15061–15072. Bibcode:2000JGR...10515061M. doi:10.1029/1999JE001224. ^ Owen, Tobias; Mahaffy, Paul; Niemann, H. B.; Atreya, Sushil; Donahue, Thomas; Bar-Nun, Akiva; de Pater, Imke (1999). "A low-temperature origin for the planetesimals that formed Jupiter". Nature. 402 (6759): 269–70. Bibcode:1999Natur.402..269O. doi:10.1038/46232. PMID 10580497. ^ Sanloup, Chrystèle; et al. (2005). "Retention of Xenon in Quartz and Earth's Missing Xenon". Science. 310 (5751): 1174–7. Bibcode:2005Sci...310.1174S. doi:10.1126/science.1119070. PMID 16293758. ^ Heymann, D.; Dziczkaniec, M. (March 19–23, 1979). Xenon from intermediate zones of supernovae. Proceedings 10th Lunar and Planetary Science Conference. Houston, Texas: Pergamon Press, Inc. pp. 1943–1959. Bibcode:1979LPSC...10.1943H. ^ Pignatari, M.; Gallino, R.; Straniero, O.; Davis, A. (2004). "The origin of xenon trapped in presolar mainstream SiC grains". Memorie della Societa Astronomica Italiana. 75: 729–734. Bibcode:2004MmSAI..75..729P. ^ Beer, H.; Kaeppeler, F.; Reffo, G.; Venturini, G. (November 1983). "Neutron capture cross-sections of stable xenon isotopes and their application in stellar nucleosynthesis". Astrophysics and Space Science. 97 (1): 95–119. Bibcode:1983Ap&SS..97...95B. doi:10.1007/BF00684613. ^ a b c Caldwell, Eric (January 2004). "Periodic Table – Xenon". Resources on Isotopes. USGS. Retrieved 2007-10-08. ^ Rajam, J. B. (1960). Atomic Physics (7th ed.). Delhi: S. Chand and Co. ISBN 81-219-1809-X. ^ Barabash, A. S. (2002). "Average (Recommended) Half-Life Values for Two-Neutrino Double-Beta Decay". Czechoslovak Journal of Physics. 52 (4): 567–573. arXiv:nucl-ex/0203001. Bibcode:2002CzJPh..52..567B. doi:10.1023/A:1015369612904. ^ Ackerman, N. (2011). "Observation of Two-Neutrino Double-Beta Decay in 136Xe with the EXO-200 Detector". Physical Review Letters. 107 (21): 212501. arXiv:1108.4193. Bibcode:2011PhRvL.107u2501A. doi:10.1103/PhysRevLett.107.212501. PMID 22181874. ^ Otten, Ernst W. (2004). "Take a breath of polarized noble gas". Europhysics News. 35 (1): 16–20. Bibcode:2004ENews..35...16O. doi:10.1051/epn:2004109. ^ Ruset, I. C.; Ketel, S.; Hersman, F. W. (2006). "Optical Pumping System Design for Large Production of Hyperpolarized 129Xe". Physical Review Letters. 96 (5): 053002. Bibcode:2006PhRvL..96e3002R. doi:10.1103/PhysRevLett.96.053002. ^ Wolber, J.; Cherubini, A.; Leach, M. O.; Bifone, A. (2000). "On the oxygenation-dependent 129Xe t1 in blood". NMR in Biomedicine. 13 (4): 234–7. doi:10.1002/1099-1492(200006)13:4<234::AID-NBM632>3.0.CO;2-K. PMID 10867702. ^ Chann, B.; Nelson, I. A.; Anderson, L. W.; Driehuys, B.; Walker, T. G. (2002). "129Xe-Xe molecular spin relaxation". Physical Review Letters. 88 (11): 113–201. Bibcode:2002PhRvL..88k3201C. doi:10.1103/PhysRevLett.88.113201. ^ von Schulthess, Gustav Konrad; Smith, Hans-Jørgen; Pettersson, Holger; Allison, David John (1998). The Encyclopaedia of Medical Imaging. Taylor & Francis. p. 194. ISBN 1-901865-13-4. ^ Warren, W. W.; Norberg, R. E. (1966). "Nuclear Quadrupole Relaxation and Chemical Shift of Xe131 in Liquid and Solid Xenon". Physical Review. 148 (1): 402–412. Bibcode:1966PhRv..148..402W. doi:10.1103/PhysRev.148.402. ^ Staff. "Hanford Becomes Operational". The Manhattan Project: An Interactive History. U.S. Department of Energy. Archived from the original on 2009-12-10. Retrieved 2007-10-10. ^ Pfeffer, Jeremy I.; Nir, Shlomo (2000). Modern Physics: An Introductory Text. Imperial College Press. pp. 421 ff. ISBN 1-86094-250-4. ^ Laws, Edwards A. (2000). Aquatic Pollution: An Introductory Text. John Wiley and Sons. p. 505. ISBN 0-471-34875-9. ^ Staff (April 9, 1979). "A Nuclear Nightmare". Time. Retrieved 2007-10-09. ^ Clayton, Donald D. (1983). Principles of Stellar Evolution and Nucleosynthesis (2nd ed.). University of Chicago Press. p. 75. ISBN 0-226-10953-4. ^ Bolt, B. A.; Packard, R. E.; Price, P. B. (2007). "John H. Reynolds, Physics: Berkeley". The University of California, Berkeley. Retrieved 2007-10-01. ^ Williams, David R. (September 1, 2004). "Mars Fact Sheet". NASA. Archived from the original on 2010-06-12. Retrieved 2007-10-10. ^ Zahnle, Kevin J. (1993). "Xenological constraints on the impact erosion of the early Martian atmosphere". Journal of Geophysical Research. 98 (E6): 10, 899–10, 913. Bibcode:1993JGR....9810899Z. doi:10.1029/92JE02941. ^ Boulos, M. S.; Manuel, O.K. (1971). "The xenon record of extinct radioactivities in the Earth". Science. 174 (4016): 1334–6. Bibcode:1971Sci...174.1334B. doi:10.1126/science.174.4016.1334. PMID 17801897. ^ a b Harding, Charlie; Johnson, David Arthur; Janes, Rob (2002). Elements of the p block. Great Britain: Royal Society of Chemistry. pp. 93–94. ISBN 0-85404-690-9. ^ Dean H Liskow; Henry F I I I Schaefer; Paul S Bagus; Bowen Liu (1973). "Probable nonexistence of xenon monofluoride as a chemically bound species in the gas phase". J Am Chem Soc. 95 (12): 4056–4057. doi:10.1021/ja00793a042. ^ Weeks, James L.; Chernick, Cedric; Matheson, Max S. (1962). "Photochemical Preparation of Xenon Difluoride". Journal of the American Chemical Society. 84 (23): 4612–4613. doi:10.1021/ja00882a063. ^ Streng, L. V.; Streng, A. G. (1965). "Formation of Xenon Difluoride from Xenon and Oxygen Difluoride or Fluorine in Pyrex Glass at Room Temperature". Inorganic Chemistry. 4 (9): 1370–1371. doi:10.1021/ic50031a035. ^ a b Tramšek, Melita; Žemva, Boris (December 5, 2006). "Synthesis, Properties and Chemistry of Xenon(II) Fluoride". Acta Chimica Slovenica. 53 (2): 105–116. doi:10.1002/chin.200721209. ^ Ogrin, Tomaz; Bohinc, Matej; Silvnik, Joze (1973). "Melting-point determinations of xenon difluoride-xenon tetrafluoride mixtures". Journal of Chemical and Engineering Data. 18 (4): 402. doi:10.1021/je60059a014. ^ a b Scott, Thomas; Eagleson, Mary (1994). "Xenon Compounds". Concise encyclopedia chemistry. Walter de Gruyter. p. 1183. ISBN 3-11-011451-8. ^ Proserpio, Davide M.; Hoffmann, Roald; Janda, Kenneth C. (1991). "The xenon-chlorine conundrum: van der Waals complex or linear molecule?". Journal of the American Chemical Society. 113 (19): 7184–7189. doi:10.1021/ja00019a014. ^ Richardson, Nancy A.; Hall, Michael B. (1993). "The potential energy surface of xenon dichloride". The Journal of Physical Chemistry. 97 (42): 10952–10954. doi:10.1021/j100144a009. ^ Brock, D.S. ; Schrobilgen, G.J. (2011). "Synthesis of the missing oxide of xenon, XeO2, and its implications for earth's missing xenon". Journal of the American Chemical Society. 133 (16): 6265–9. doi:10.1021/ja110618g. PMID 21341650. ^ "Chemistry: Where did the xenon go?". Nature. 471 (7337): 138–138. 2011. Bibcode:2011Natur.471T.138.. doi:10.1038/471138d. ^ Zhou, M.; Zhao, Y.; Gong, Y.; Li, J. (2006). "Formation and Characterization of the XeOO+ Cation in Solid Argon". Journal of the American Chemical Society. 128 (8): 2504–5. doi:10.1021/ja055650n. PMID 16492012. ^ Holloway, John H.; Hope, Eric G. (1998). A. G. Sykes (ed.). Advances in Inorganic Chemistry Press. Academic. p. 65. ISBN 0-12-023646-X. ^ a b Henderson, W. (2000). Main group chemistry. Great Britain: Royal Society of Chemistry. pp. 152–153. ISBN 0-85404-617-8. ^ a b c d Mackay, Kenneth Malcolm; Mackay, Rosemary Ann; Henderson, W. (2002). Introduction to modern inorganic chemistry (6th ed.). CRC Press. pp. 497–501. ISBN 0-7487-6420-8. ^ Smith, D. F. (1963). "Xenon Oxyfluoride". Science. 140 (3569): 899–900. Bibcode:1963Sci...140..899S. doi:10.1126/science.140.3569.899. PMID 17810680. ^ Christe, K. O.; Dixon, D. A.; Sanders, J. C. P.; Schrobilgen, G. J.; Tsai, S. S.; Wilson, W. W. (1995). "On the Structure of the [XeOF5]− Anion and of Heptacoordinated Complex Fluorides Containing One or Two Highly Repulsive Ligands or Sterically Active Free Valence Electron Pairs". Inorg. Chem. 34 (7): 1868–1874. doi:10.1021/ic00111a039. ^ Christe, K. O.; Schack, C. J.; Pilipovich, D. (1972). "Chlorine trifluoride oxide. V. Complex formation with Lewis acids and bases". Inorg. Chem. 11 (9): 2205–2208. doi:10.1021/ic50115a044. ^ Holloway, John H.; Hope, Eric G. (1998). Advances in Inorganic Chemistry. Contributor A. G. Sykes. Academic Press. pp. 61–90. ISBN 0-12-023646-X. ^ Frohn, H.; Theißen, Michael (2004). "C6F5XeF, a versatile starting material in xenon–carbon chemistry". Journal of Fluorine Chemistry. 125 (6): 981–988. doi:10.1016/j.jfluchem.2004.01.019. ^ Goetschel, Charles T.; Loos, Karl R. (1972). "Reaction of xenon with dioxygenyl tetrafluoroborate. Preparation of FXe-BF2". Journal of the American Chemical Society. 94 (9): 3018–3021. doi:10.1021/ja00764a022. ^ Li, Wai-Kee; Zhou, Gong-Du; Mak, Thomas C. W. (2008). Gong-Du Zhou; Thomas C. W. Mak (eds.). Advanced Structural Inorganic Chemistry. Oxford University Press. p. 678. ISBN 0-19-921694-0. ^ Li, Wai-Kee; Zhou, Gong-Du; Mak, Thomas C. W. (2008). Advanced Structural Inorganic Chemistry. Oxford University Press. p. 674. ISBN 0-19-921694-0. ^ Gerber, R. B. (2004). "Formation of novel rare-gas molecules in low-temperature matrices". Annual Review of Physical Chemistry. 55 (1): 55–78. Bibcode:2004ARPC...55...55G. doi:10.1146/annurev.physchem.55.091602.094420. PMID 15117247. ^ Khriachtchev, Leonid; Isokoski, Karoliina; Cohen, Arik; Räsänen, Markku; Gerber, R. Benny (2008). "A Small Neutral Molecule with Two Noble-Gas Atoms: HXeOXeH". Journal of the American Chemical Society. 130 (19): 6114–8. doi:10.1021/ja077835v. PMID 18407641. ^ Pettersson, Mika; Khriachtchev, Leonid; Lundell, Jan; Räsänen, Markku (1999). "A Chemical Compound Formed from Water and Xenon: HXeOH". Journal of the American Chemical Society. 121 (50): 11904–11905. doi:10.1021/ja9932784. ^ Pauling, L. (1961). "A molecular theory of general anesthesia". Science. 134 (3471): 15–21. Bibcode:1961Sci...134...15P. doi:10.1126/science.134.3471.15. PMID 13733483. Reprinted as Pauling, Linus; Kamb, Barclay, eds. (2001). Linus Pauling: Selected Scientific Papers. 2. River Edge, New Jersey: World Scientific. pp. 1328–1334. ISBN 981-02-2940-2. ^ Henderson, W. (2000). Main group chemistry. Great Britain: Royal Society of Chemistry. p. 148. ISBN 0-85404-617-8. ^ Ikeda, Tomoko; Mae, Shinji; Yamamuro, Osamu; Matsuo, Takasuke; Ikeda, Susumu; Ibberson, Richard M. (November 23, 2000). "Distortion of Host Lattice in Clathrate Hydrate as a Function of Guest Molecule and Temperature". Journal of Physical Chemistry A. 104 (46): 10623–10630. Bibcode:2000JPCA..10410623I. doi:10.1021/jp001313j. ^ Kleppe, Annette K.; Amboage, Mónica; Jephcoat, Andrew P. (2014). "New high-pressure van der Waals compound Kr(H2)4 discovered in the krypton-hydrogen binary system". Scientific Reports. 4. Bibcode:2014NatSR...4E4989K. doi:10.1038/srep04989. ^ McKay, C. P.; Hand, K. P.; Doran, P. T.; Andersen, D. T.; Priscu, J. C. (2003). "Clathrate formation and the fate of noble and biologically useful gases in Lake Vostok, Antarctica". Geophysical Research Letters. 30 (13): 35. Bibcode:2003GeoRL..30.1702M. doi:10.1029/2003GL017490. ^ Barrer, R. M.; Stuart, W. I. (1957). "Non-Stoichiometric Clathrate of Water". Proceedings of the Royal Society of London. 243 (1233): 172–189. Bibcode:1957RSPSA.243..172B. doi:10.1098/rspa.1957.0213. ^ Frunzi, Michael; Cross, R. James; Saunders, Martin (2007). "Effect of Xenon on Fullerene Reactions". Journal of the American Chemical Society. 129 (43): 13343–6. doi:10.1021/ja075568n. PMID 17924634. ^ Silfvast, William Thomas (2004). Laser Fundamentals. Cambridge University Press. ISBN 0-521-83345-0. ^ Webster, John G. (1998). The Measurement, Instrumentation, and Sensors Handbook. Springer. ISBN 3-540-64830-5. ^ McGhee, Charles; Taylor, Hugh R.; Gartry, David S.; Trokel, Stephen L. (1997). Excimer Lasers in Ophthalmology. Informa Health Care. ISBN 1-85317-253-7. ^ Staff (2007). "Xenon Applications". Praxair Technology. Retrieved 2007-10-04. ^ Baltás, E.; Csoma, Z.; Bodai, L.; Ignácz, F.; Dobozy, A.; Kemény, L. (2003). "A xenon-iodine electric discharge bactericidal lamp". Technical Physics Letters. 29 (10): 871–872. Bibcode:2003TePhL..29..871S. doi:10.1134/1.1623874. ^ Skeldon, M. D.; Saager, R.; Okishev, A.; Seka, W. (1997). "Thermal distortions in laser-diode- and flash-lamp-pumped Nd:YLF laser rods" (PDF). LLE Review. 71: 137–144. Archived from the original (PDF) on October 16, 2003. Retrieved 2007-02-04. ^ Anonymous. "The plasma behind the plasma TV screen". Plasma TV Science. Archived from the original on October 15, 2007. Retrieved 2007-10-14. ^ Marin, Rick (March 21, 2001). "Plasma TV: That New Object Of Desire". The New York Times. Retrieved 2009-04-03. ^ Waymouth, John (1971). Electric Discharge Lamps. Cambridge, MA: MIT Press. ISBN 0-262-23048-8. ^ Patel, C. K. N.; Bennett Jr., W. R.; Faust, W. L.; McFarlane, R. A. (August 1, 1962). "Infrared spectroscopy using stimulated emission techniques". Physical Review Letters. 9 (3): 102–104. Bibcode:1962PhRvL...9..102P. doi:10.1103/PhysRevLett.9.102. ^ Patel, C. K. N.; Faust, W. L.; McFarlane, R. A. (December 1, 1962). "High gain gaseous (Xe-He) optical masers". Applied Physics Letters. 1 (4): 84–85. Bibcode:1962ApPhL...1...84P. doi:10.1063/1.1753707. ^ Bennett, Jr., W. R. (1962). "Gaseous optical masers". Applied Optics. 1 (S1): 24–61. Bibcode:1962ApOpt...1S..24B. doi:10.1364/AO.1.000024. ^ "Laser Output". University of Waterloo. Retrieved 2007-10-07. ^ Singh, Sanjay (May 15, 2005). "Xenon: A modern anaesthetic". Indian Express Newspapers Limited. Archived from the original on 2007-08-13. Retrieved 2007-10-10. ^ Tonner, P. H. (2006). "Xenon: one small step for anaesthesia ... ? (editorial review)". Current Opinion in Anesthesiology. 19 (4): 382–4. doi:10.1097/01.aco.0000236136.85356.13. PMID 16829718. ^ a b Banks, P.; Franks, N. P.; Dickinson, R. (2010). "Competitive inhibition at the glycine site of the N-methyl-D-aspartate receptor mediates xenon neuroprotection against hypoxia-ischemia". Anesthesiology. 112 (3): 614–22. doi:10.1097/ALN.0b013e3181cea398. PMID 20124979. ^ Ma, D.; Wilhelm, S.; Maze, M.; Franks, N. P. (2002). "Neuroprotective and neurotoxic properties of the 'inert' gas, xenon" (PDF). Br J Anaesth. 89 (5): 739–46. doi:10.1093/bja/89.5.739. PMID 12393773. ^ Nagata, A.; Nakao Si, S.; Nishizawa, N.; Masuzawa, M.; Inada, T.; Murao, K.; Miyamoto, E.; Shingu, K. (2001). "Xenon inhibits but N(2)O enhances ketamine-induced c-Fos expression in the rat posterior cingulate and retrosplenial cortices". Anesth Analg. 92 (2): 362–8. doi:10.1213/00000539-200102000-00016. PMID 11159233. ^ Sakamoto, S.; Nakao, S.; Masuzawa, M.; Inada, T.; Maze, M.; Franks, N. P.; Shingu, K. (2006). "The differential effects of nitrous oxide and xenon on extracellular dopamine levels in the rat nucleus accumbens: a microdialysis study". Anesth Analg. 103 (6): 1459–63. doi:10.1213/01.ane.0000247792.03959.f1. PMID 17122223. ^ Gruss, M.; Bushell, T. J.; Bright, D. P.; Lieb, W. R.; Mathie, A.; Franks, N. P. (2004). "Two-pore-domain K+ channels are a novel target for the anesthetic gases xenon, nitrous oxide, and cyclopropane". Mol Pharmacol. 65 (2): 443–52. doi:10.1124/mol.65.2.443. PMID 14742687. ^ Yamakura, T.; Harris, R. A. (2000). "Effects of gaseous anesthetics nitrous oxide and xenon on ligand-gated ion channels. Comparison with isoflurane and ethanol". Anesthesiology. 93 (4): 1095–101. doi:10.1097/00000542-200010000-00034. PMID 11020766. ^ Rashid, M. H.; Furue, H.; Yoshimura, M.; Ueda, H. (2006). "Tonic inhibitory role of α4β2 subtype of nicotinic acetylcholine receptors on nociceptive transmission in the spinal cord in mice". Pain. 125 (1–2): 125–35. doi:10.1016/j.pain.2006.05.011. PMID 16781069. ^ Lopez, Maria M.; Kosk-Kosicka, Danuta (1995). "How Do Volatile Anesthetics Inhibit Ca2+-ATPases?". The Journal of Biological Chemistry. 270 (47): 28239–28245. doi:10.1074/jbc.270.47.28239. ^ Suzuki, T.; Koyama, H.; Sugimoto, M.; Uchida, I.; Mashimo, T. (2002). "The diverse actions of volatile and gaseous anesthetics on human-cloned 5-hydroxytryptamine3 receptors expressed in Xenopus oocytes". Anesthesiology. 96 (3): 699–704. doi:10.1097/00000542-200203000-00028. PMID 11873047. ^ Nickalls, R. W. D; Mapleson, W.W. "Age‐related iso‐MAC charts for isoflurane, sevoflurane and desflurane in man". British Journal of Anesthesiology. ^ Goto, T.; Nakata Y; Morita S (2003). "Will xenon be a stranger or a friend? : the cost, benefit, and future of xenon anesthesia". Anesthesiology. 98 (1): 1–2. doi:10.1097/00000542-200301000-00002. PMID 12502969. ^ Schmidt, Michael; Marx, Thomas; Glöggl, Egon; Reinelt, Helmut; Schirmer, Uwe (May 2005). "Xenon Attenuates Cerebral Damage after Ischemia in Pigs". Anesthesiology. 102 (5): 929–936. doi:10.1097/00000542-200505000-00011. PMID 15851879. ^ Dingley, J.; Tooley, J.; Porter, H.; Thoresen, M. (2006). "Xenon Provides Short-Term Neuroprotection in Neonatal Rats When Administered After Hypoxia-Ischemia". Stroke. 37 (2): 501–6. doi:10.1161/01.STR.0000198867.31134.ac. PMID 16373643. ^ Weber, N. C.; Toma, O.; Wolter, J. I.; Obal, D.; Müllenheim, J.; Preckel, B.; Schlack, W. (2005). "The noble gas xenon induces pharmacological preconditioning in the rat heart in vivo via induction of PKC-epsilon and p38 MAPK". Br J Pharmacol. 144 (1): 123–32. doi:10.1038/sj.bjp.0706063. PMC��1575984. PMID 15644876. ^ Bantel, C.; Maze, M.; Trapp, S. (2009). "Neuronal preconditioning by inhalational anesthetics: evidence for the role of plasmalemmal adenosine triphosphate-sensitive potassium channels". Anesthesiology. 110 (5): 986–95. doi:10.1097/ALN.0b013e31819dadc7. PMC 2930813. PMID 19352153. ^ Bantel, C.; Maze, M.; Trapp, S. (2010). "Noble gas xenon is a novel adenosine triphosphate-sensitive potassium channel opener". Anesthesiology. 112 (3): 623–30. doi:10.1097/ALN.0b013e3181cf894a. PMC 2935677. PMID 20179498. ^ "Breathe it in". The Economist. 8 February 2014. ^ "WADA amends Section S.2.1 of 2014 Prohibited List". 31 August 2014. ^ Jelkmann, W. (2014). "Xenon Misuse in Sports". Deutsche Zeitschrift für Sportmedizin. Deutsche Zeitschrift Fur Sportmedizin/German Journal of Sports Medicine. 2014 (10): 267–271. doi:10.5960/dzsm.2014.143. ^ Van Der Wall, Ernst (1992). What's New in Cardiac Imaging? : SPECT, PET, and MRI. Springer. ISBN 0-7923-1615-0. ^ Frank, John (1999). "Introduction to imaging: The chest". Student BMJ. 12: 1–44. Retrieved 2008-06-04. ^ Albert, M. S.; Balamore, D. (1998). "Development of hyperpolarized noble gas MRI". Nuclear Instruments and Methods in Physics Research A. 402 (2–3): 441–53. Bibcode:1998NIMPA.402..441A. doi:10.1016/S0168-9002(97)00888-7. PMID 11543065. ^ Irion, Robert (March 23, 1999). "Head Full of Xenon?". Science News. Archived from the original on January 17, 2004. Retrieved 2007-10-08. ^ Wolber, J.; Rowland, I. J.; Leach, M. O.; Bifone, A. (1998). "Intravascular delivery of hyperpolarized 129Xenon for in vivo MRI". Applied Magnetic Resonance. 15 (3–4): 343–352. doi:10.1007/BF03162020. ^ Driehuys, B.; Möller, H.E. ; Cleveland, Z.I. ; Pollaro, J.; Hedlund, L.W. (2009). "Pulmonary perfusion and xenon gas exchange in rats: MR imaging with intravenous injection of hyperpolarized 129Xe". Radiology. 252 (2): 386–93. doi:10.1148/radiol.2522081550. PMC 2753782. PMID 19703880. ^ Cleveland, Z.I. ; Möller, H.E. ; Hedlund, L.W. ; Driehuys, B. (2009). "Continuously infusing hyperpolarized 129Xe into flowing aqueous solutions using hydrophobic gas exchange membranes". The Journal of Physical Chemistry. 113 (37): 12489–99. doi:10.1021/jp9049582. PMC 2747043. PMID 19702286. ^ Baltás, E.; Csoma, Z.; Bodai, L.; Ignácz, F.; Dobozy, A.; Kemény, L. (2006). "Treatment of atopic dermatitis with the xenon chloride excimer laser". Journal of the European Academy of Dermatology and Venereology. 20 (6): 657–60. doi:10.1111/j.1468-3083.2006.01495.x. PMID 16836491. ^ Luhmer, M.; Dejaegere, A.; Reisse, J. (1989). "Interpretation of the solvent effect on the screening constant of Xe-129". Magnetic Resonance in Chemistry. 27 (10): 950–952. doi:10.1002/mrc.1260271009. ^ Rubin, Seth M.; Spence, Megan M.; Goodson, Boyd M.; Wemmer, David E.; Pines, Alexander (August 15, 2000). "Evidence of nonspecific surface interactions between laser-polarized xenon and myoglobin in solution". Proceedings of the National Academy of Sciences USA. 97 (17): 9472–5. Bibcode:2000PNAS...97.9472R. doi:10.1073/pnas.170278897. PMC 16888. PMID 10931956. ^ Raftery, Daniel; MacNamara, Ernesto; Fisher, Gregory; Rice, Charles V.; Smith, Jay (1997). "Optical Pumping and Magic Angle Spinning: Sensitivity and Resolution Enhancement for Surface NMR Obtained with Laser-Polarized Xenon". Journal of the American Chemical Society. 119 (37): 8746–8747. doi:10.1021/ja972035d. ^ Gaede, H. C.; Song, Y. -Q.; Taylor, R. E.; Munson, E. J.; Reimer, J. A.; Pines, A. (1995). "High-field cross polarization NMR from laser-polarized xenon to surface nuclei". Applied Magnetic Resonance. 8 (3–4): 373–384. doi:10.1007/BF03162652. ^ Galison, Peter Louis (1997). Image and Logic: A Material Culture of Microphysics. University of Chicago Press. p. 339. ISBN 0-226-27917-0. ^ Fontaine, J.-P.; Pointurier, F.; Blanchard, X.; Taffary, T. (2004). "Atmospheric xenon radioactive isotope monitoring". Journal of Environmental Radioactivity. 72 (1–2): 129–35. doi:10.1016/S0265-931X(03)00194-2. PMID 15162864. ^ Garwin, Richard L.; von Hippel Frank N. (November 2006). "A Technical Analysis: Deconstructing North Korea's October 9 Nuclear Test". Arms Control Today. Arms Control Association. 38 (9). Retrieved 2009-03-26. ^ Gallucci, G. (2009). "The MEG liquid xenon calorimeter". Journal of Physics: Conference Series. 160 (1): 012011. Bibcode:2009JPhCS.160a2011G. doi:10.1088/1742-6596/160/1/012011. ^ Zona, Kathleen (March 17, 2006). "Innovative Engines: Glenn Ion Propulsion Research Tames the Challenges of 21st century Space Travel". NASA. Archived from the original on September 15, 2007. Retrieved 2007-10-04. ^ "Dawn Launch: Mission to Vesta and Ceres" (PDF). NASA. Retrieved 2007-10-01. ^ Brazzle, J. D.; Dokmeci, M. R.; Mastrangelo, C. H. (July 28 – August 1, 1975). Modeling and Characterization of Sacrificial Polysilicon Etching Using Vapor-Phase Xenon Difluoride. Proceedings 17th IEEE International Conference on Micro Electro Mechanical Systems (MEMS). Maastricht, Netherlands: IEEE. pp. 737–740. ISBN 978-0-7803-8265-7. ^ Staff (2007). "Neil Bartlett and the Reactive Noble Gases". American Chemical Society. Retrieved June 5, 2012. ^ Staff (December 21, 2004). "Protein Crystallography: Xenon and Krypton Derivatives for Phasing". Daresbury Laboratory, PX. Archived from the original on 2005-03-16. Retrieved 2007-10-01. ^ Drenth, Jan; Mesters, Jeroen (2007). "The Solution of the Phase Problem by the Isomorphous Replacement Method". Principles of Protein X-Ray Crystallography (3rd ed.). New York: Springer. pp. 123–171. doi:10.1007/0-387-33746-6_7. ISBN 978-0-387-33334-2. ^ a b Finkel, A. J.; Katz, J. J.; Miller, C. E. (April 1, 1968). "Metabolic and toxicological effects of water-soluble xenon compounds are studied". NASA. Retrieved 2007-10-04. ^ LeBlanc, Adrian D.; Johnson, Philip C. (1971). "The handling of xenon-133 in clinical studies". Physics in Medicine and Biology. 16 (1): 105–9. Bibcode:1971PMB....16..105L. doi:10.1088/0031-9155/16/1/310. PMID 5579743. ^ 169.44 m/s in xenon (at 0°C and 107 kPa), compared to 344 m/s in air. See: Vacek, V.; Hallewell, G.; Lindsay, S. (2001). "Velocity of sound measurements in gaseous per-fluorocarbons and their mixtures". Fluid Phase Equilibria. 185 (1–2): 305–314. doi:10.1016/S0378-3812(01)00479-4. ^ Spangler, Steve (2007). "Anti-Helium – Sulfur Hexafluoride". Steve Spangler Science. Archived from the original on September 29, 2007. Retrieved 2007-10-04. ^ Yamaguchi, K.; Soejima, K.; Koda, E.; Sugiyama, N (2001). "Inhaling Gas With Different CT Densities Allows Detection of Abnormalities in the Lung Periphery of Patients With Smoking-Induced COPD". Chest. 120 (6): 1907–16. doi:10.1378/chest.120.6.1907. PMID 11742921. ^ Staff (August 1, 2007). "Cryogenic and Oxygen Deficiency Hazard Safety". Stanford Linear Accelerator Center. Archived from the original on June 9, 2007. Retrieved 2007-10-10.